This is to inform you with a lot of happiness that the money you sent for the teachers accommodation has finally arrived on the School Account. This is indeed good news for the AJS community and we thank you all plus all the fans of Gillian that mobilized this money for this noble cause. We are really short of words to express our happiness because with this money we shall be able to start straight away to procure building materials so that the work can start. When I told the Teachers about this good news they were all very excited and asked me to pass on their thanks to you all. A big Thank You to all of you for your generous hearts and we ask the Almighty God to reward you abundantly. We shall be updating you on the progress of the construction as soon as we start. These are the photos of the 12 children that received bursaries (Scholarships) from the Gillian fans. I have also included photos of pupils of the lower, middle and upper sections together with their teachers. They are all saying that they thank you so much for your support. Without your assistance they would have found it difficult to meet their education costs. Once again thank you for loving us so much and being good ambassadors of AJS. May the Almighty GOD reward your efforts. On behalf of the entire AJS community I wish to convey to you our thanks from the bottom of our hearts for this contribution which will go a long way in helping the needy children in accessing quality education. Thank you so much for this donation. May the Almighty reward your efforts. Click here to view the new photos. It is with great pleasure that I bring you good news that the fruits of your hard labour and your good hearts has finally paid off. 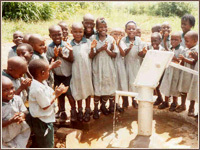 The borehole project is now complete as it can be witnessed with the attached photos. We are really short of words to express our joy and happiness that what was initially a dream is now a reality. Thank you so much for this donation and for even other donations that you have extended to AJS. The entire AJS community is so excited by this project because they have really been suffering due to lack of clean and safe water. Our only prayer is that May the Almighty God shower you with his blessings and may you leave for long because we really need you around. May all your efforts be rewarded a billion times. Sincerely you need to come over here to Uganda and see for yourselves what impact your contributions have made at AJS. In the photos you will see men working, pupils drawing water and see the vehicle that was taking away the workers after completing the borehole project. Dear all fans of Gillian, thank you for honouring Gillian's appeal of assisting AJS. We shall continue to pray for you in our daily prayers. On behalf of the entire community of Alinyiikira Junior School, I would like to convey to you our sincere thanks to you all for this great contribution of $8,523 towards the construction of a classroom block. The money has finally arrived and it is already on the School account. Thank you, Thank you very much for this contribution and I assure you it is going to be put to good use. 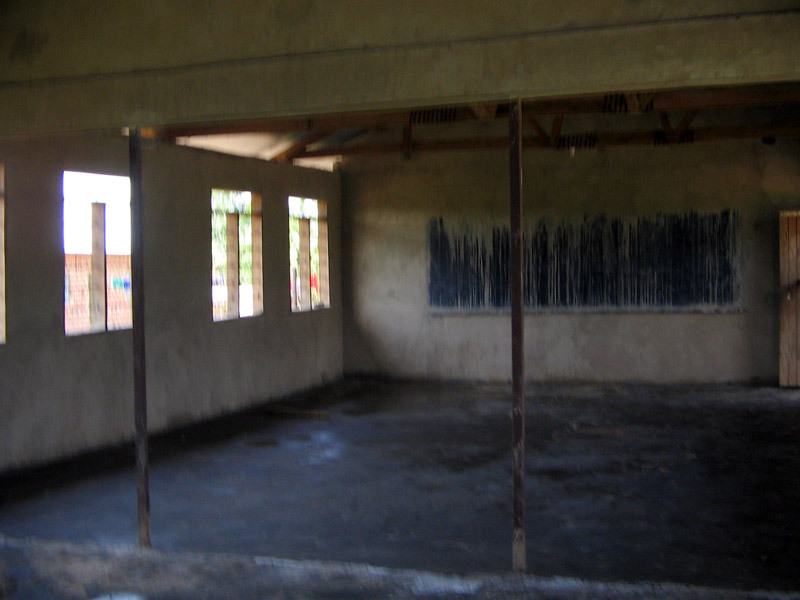 In fact after looking at the available space at the School we decided that we can embark on the construction of the storeyed structure because this will help us to maximally utilize our space. This money will be used to start on the ground floor and we intend to do this building in phases. I will be sending you pictures showing the progress of the work. The architectural drawings have already been done and the structural plans (drawings) are soon to be completed. We shall continue to always pray for your because we have always been thinking of how we shall be able to raise this money. This contribution has really been timely. Thank you, Thank you x1000 times. Happy Birthday to you Gillian Anderson and may you live a 1000 years. 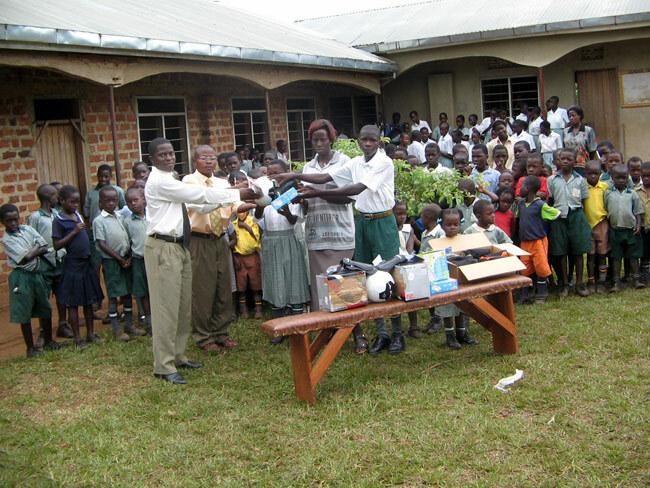 You birthday and of course these contributions are going to bring change to the School, the local area and indeed the whole Uganda since the School is educating children of the Nation. For Gillian Anderson Fans, we shall continue to pray for you so that you do not get tired of helping the School because the demands are really many though the resources are limited. May the Almighty God reward you most abundantly. On behalf of the management, staff and Pupils of Alinyiikira Junior School, I would like to thank you all that contributed money towards the purchase of computers and a printer for the school. 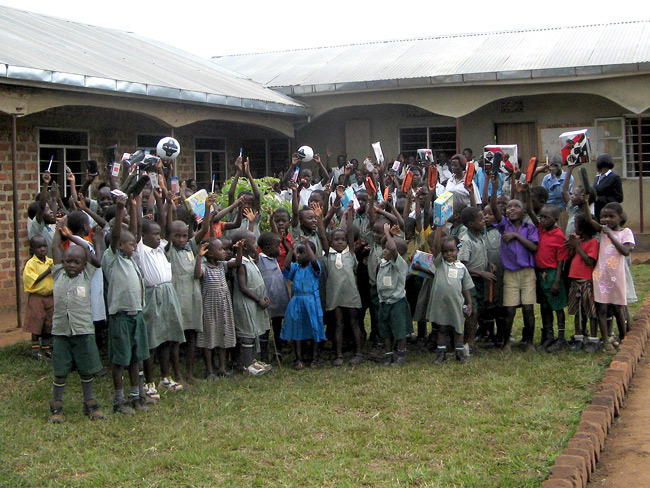 The staff and the children were extremely happy to receive those brand new computers and a printer. We managed to acquire two computers, two UPS and a printer. We thank you all for your kindness and generous hearts and we thank the almighty to reward you abundantly. We are looking forward to have a complete computer lab where we can have many computer sets so that we can comfortably offer computer training to the children, staff and other people who are interested in acquiring computer skills. Attached are pictures showing the children when they are unpacking the computers, doing some practices on the computers and also showing teachers when they are learning computer skills. Warm Greetings from Uganda especially Alinyiikira Junior School. First of all I would like to thank you for all your assistance. Due to that assistance the school has now been granted a centre Number by the National Examination Body. The children will now not have to travel a long distance to sit for their Primary Leaving Examinations. 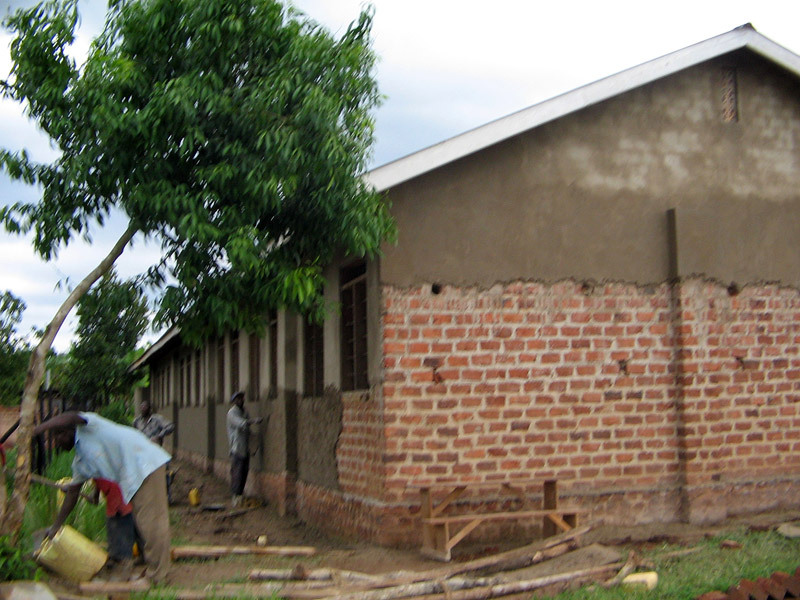 We are now looking forward to put in place another class room block to cater for the increasing numbers. I would like to thank you all for all your contributions that have enabled the School to finally get connected to the Electricity Grid. The School is now fully connected and the pupils plus the parents are all very excited about this new development. 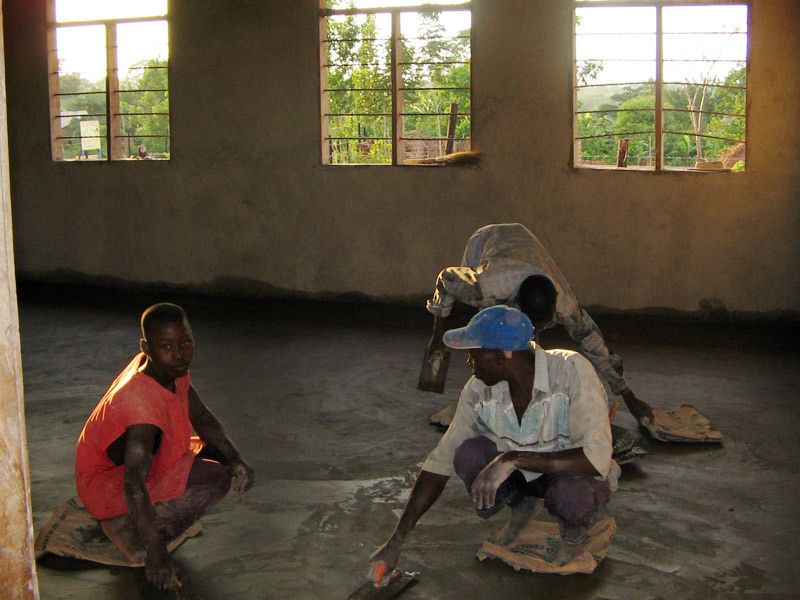 In addition to the Electricity connection, the work of plastering the building and cementing of the floor has also been completed. A big THANK YOU to you ALL. In fact, we are short of words to use to express our happiness for that big achievement for the school. This has been possible because of your kind assistance. We just pray to the good LORD to reward you abundantly. You will always be part of our prayers. Attached please find the photos showing the Substation (transformer) that steps down the electricity, transmission line, cables connected to the building from the transmission pole up to the meter box that is connected to one of the buildings, a teacher teaching in class after connecting the power, a pupil switching on the power in class, plus other photos of the plastered building taken at different angles to show the front, back and the side of the building. 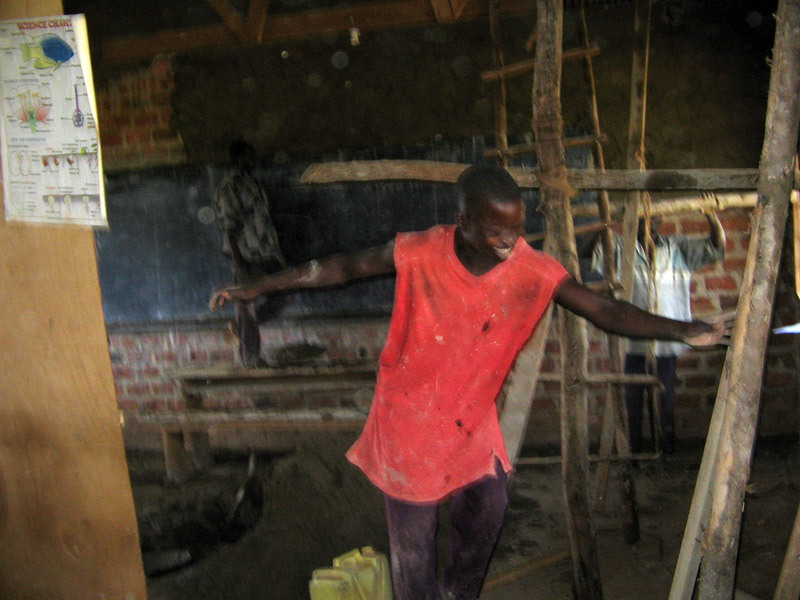 On the plastering of the walls and cementing of the floor, the work is progressing on well and the workers have been working very fast to finish it as early as possible. In fact, this has been very fast that it may be completed by end of this week. 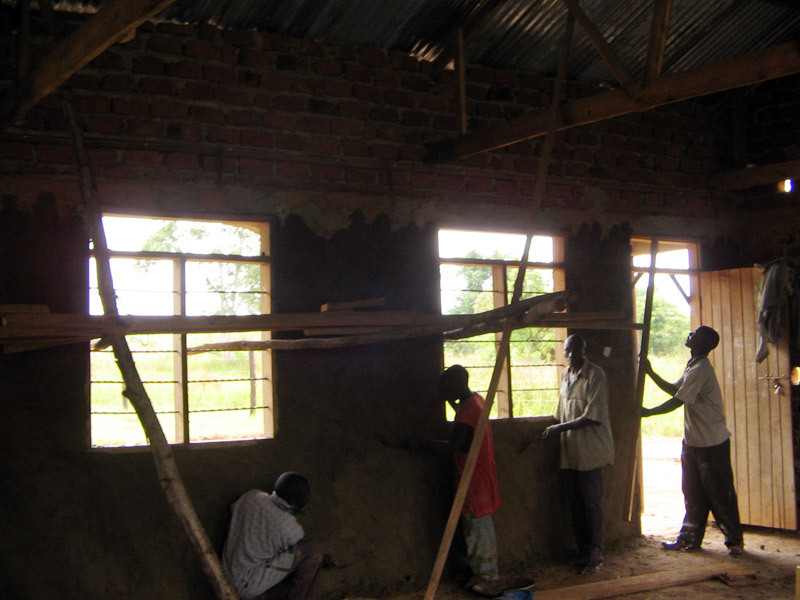 I am going to attach the photos of the progress of the work showing men working on the building. On the update of the power connection, the transmission line has been constructed up to the school and what is remaining is fixing the substation (transformer) on the main grid of 33KVA to step it down for domestic use. This should have been finished by now but the electricity company has so many pending jobs which they have to handle. But since the transmission line has been constructed, what is remaining is not so difficult so we hope that it will be done probably before end of this month. We wish to thank you all for this assistance, for it has made the building look beautiful and the children and parents are very excited. Thank you all for that generosity and May the almighty God reward you abundantly. Thank you very much for your tireless efforts in assisting the School. On the issue of Power connection, I am following it up aggressively and they have now promised me that it will be worked on this week. They have really been overwhelmed with a lot of work being that this is a campaign period they have to extend power to many areas to fulfill some of the promises some politicians made to the people. Of course there were also people who had applied before us and they had not been connected but possibly very soon I may give good news that the connection has been done. Right now we have an immediate need for something else. 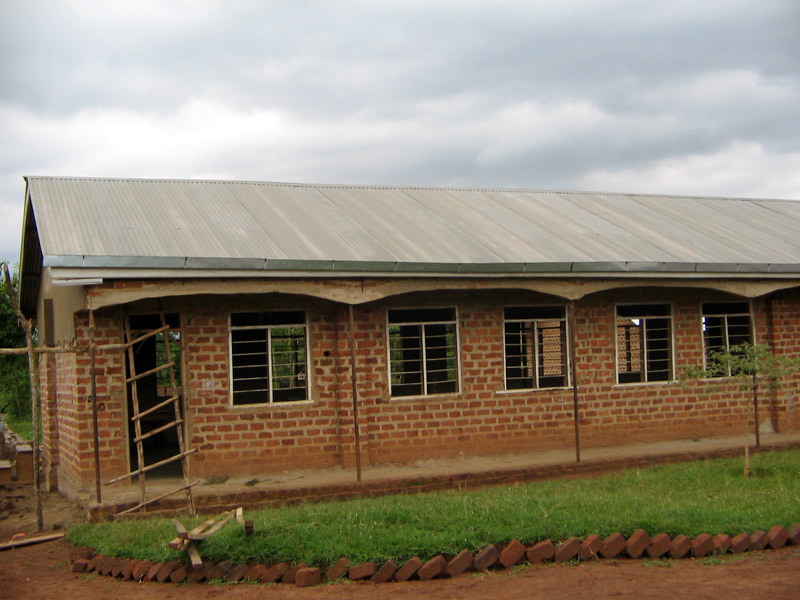 The school needs to get an Examination Centre Number (a required standard of the Uganda Examination Board) so that Final Examinations can be sat at the School instead of transporting the students to other schools which is quite expensive. In order to get this Examination Centre Number we need to have plastered walls and cemented floors (prevents students from getting chiggers). The deadline of submitting the application forms for the Centre Number is 28/2/06. 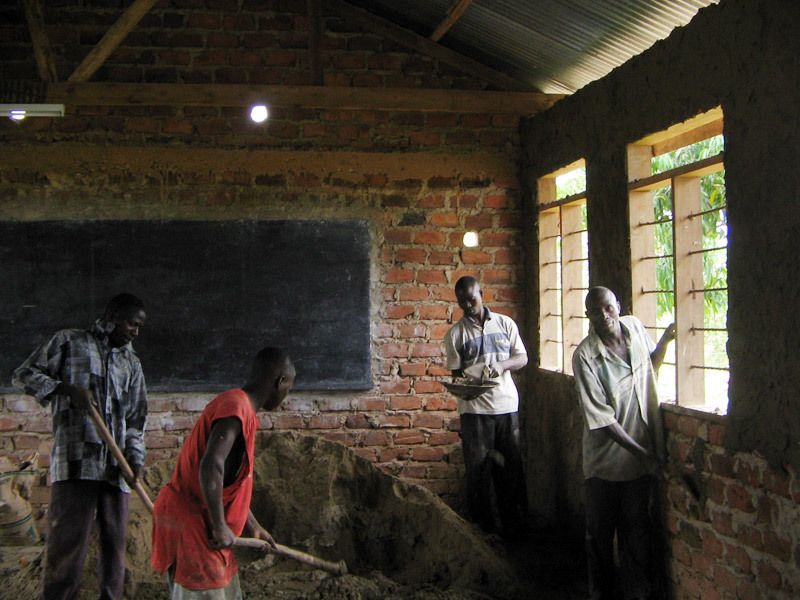 So if the work starts this month we can submit these forms knowing that by the time inspectors come to inspect the School, they will find the walls already plastered and floors cemented. Within one and half weeks this work will have been finished if all materials are on site. We can have enough man power to do the work expeditiously without much interruption. We can keep on shifting children as these people do the work. The quote for doing the floors and the walls is US$ 2,500. Wishing you all the best and thanks once again for your kindness. Hope the new year has started off very well. We are also O.K. but still struggling with the Electricity Company to hook us on the Grid. They keep on promising us that it will be done soon but anyway, we hope that we shall have power before the new term begins. There are many applicants that they are working on but our case is one of the priority cases. We once again thank you for all that you have done in raising the money that enabled us to meet these costs. We pray to the Almighty God to reward you most abundantly. Godfrey, the headmaster, has provided us with photos of the children with the first donations they've received which include pencil cases, pens, erasers, jigsaw puzzles, and soccer balls. Godfrey and the children thank everyone for their kindness and generosity! * All pupils from P3 -P7 were given a pen each. * The 20 pencils cases were given to pupils of P1 & P2. * The 20 erasers were given to the best two performers in each class from P1-P7. * The kids in Nursery Section are to use the jigsaw puzzles with the help of their teacher. * The two balls will be used by the whole school (one for the girls and the other for the boys). Reminder: We do not advise people to send packages. Although these two packages arrived safely, several others shipped simultaneously have yet to appear. 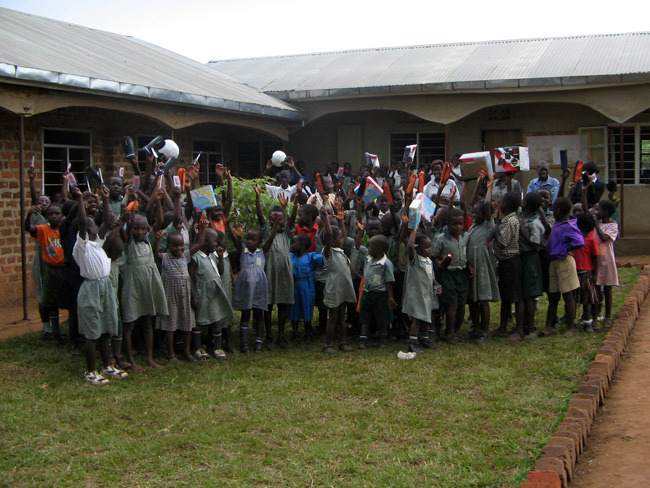 Thank you so much everyone for your extremely generous donations to the Ugandan school. I am going to be visiting the school in the next month and I hope that during that time, as the direct result of your support, we will be able to get them hooked up to the power grid for the very first time. I think it is important, as it has previously been announced, that we move slowly and not inundate them with too much from the west. That we respect how overwhelming it might be and that our ultimate goal is sustainability. That said, the connection to the grid will be the goal before Christmas. Perhaps then, when the new term starts it will be appropriate for the book donations to get made. In the meantime, I will continue to discuss with those involved when it would be best for the donations of tuition for individual students to start up. But just know that we are moving forward and I will keep you posted with how the school is doing and where your very helpful $ have gone. I am presently in Ethiopia after finishing shooting in Uganda on Last King of Scotland. 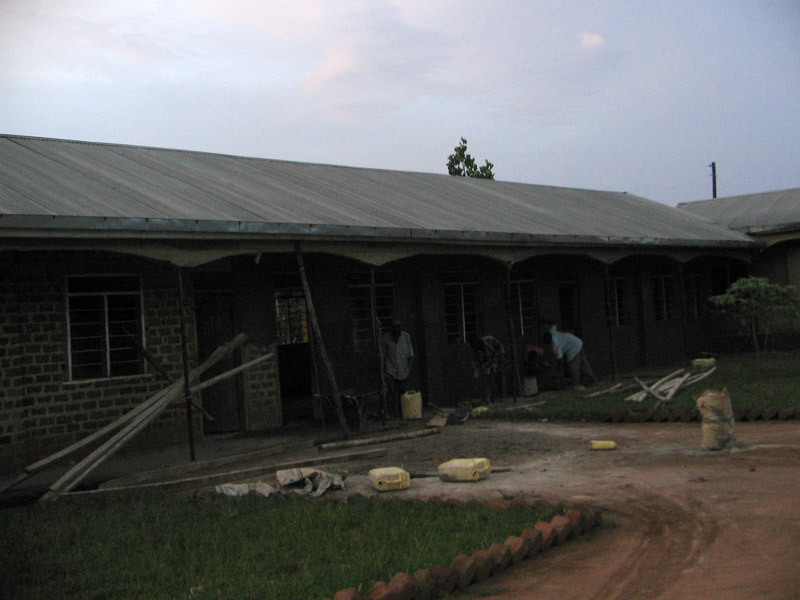 One of the things I did while in Kampala was to visit a school that a friend is chairman of. The school has been open for almost two years and has about 120 students in one of the poorer parts of the city. They have no electricity and hardly any books and have filled up their exercise books I don't know how many months ago, and some of the kids cannot afford the uniforms, etc. etc. etc. And yet the children are incredibly bright and disciplined and so ready and willing to learn. The afternoon I was there, they held an assembly for me outside and I talked to them briefly about a few things until the sky opened up in a torrential downpour. We took cover in a hall with a dirt floor and a tin roof and my assumption that we might be able to continue the assembly was soon thwarted by the fact that I could not even hear myself speak. And so after sitting around silently twiddling our thumbs for fifteen minutes I asked if they had any songs they could sing. They ended up singing four long beautiful African songs accompanied by dance moves, solos, and percussion -- two boys crouched in the corner banging on yellow plastic jugs with sticks, as the rain pounded above us and my smile grew and grew and grew. 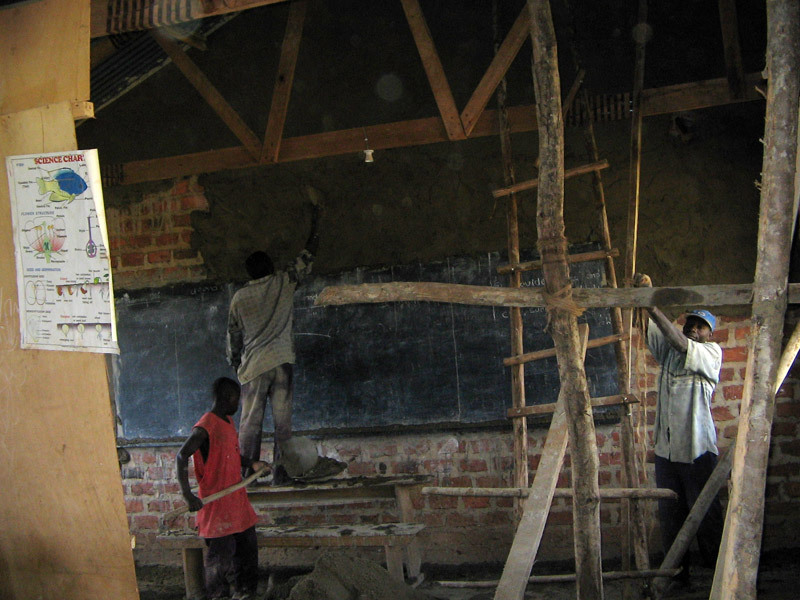 Over the next few years I think I will be focusing more on schools in Africa and this will be the first. I would love for any of you who are interested to be a part of it. I am attaching a list of what they need. Obviously, there are things on the list which seem more immediate than others. For instance a computer or two is superfluous without power. Some of you may think that it is more important that they have musical instruments than math books, or teachers desks than chalk boards. Or that the first thing to focus on is raising money for solar panels which is also one of the attachments. But there are things that are not on the list such as school fees per term per child, or supplementing food with some form of protein to accompany the regular portion of porridge once a day, or contributing to teachers fees which are half as much as they would make in the city, and their sleeping quarters which are basically nonexistent. It seems endless but the fact is it takes very little to make a huge difference in each of their lives. While Jules was at the school he bought eight children new shoes and he bought the school a duplicating machine which is what was around before copy machines - the power issue again. After I left I sent back 10 cartons of chalk and two footballs and committed to supplying them with 200-400 exercise books for the new school year. The list is accompanied by what each item would cost per unit in Ugandan shillings and then the total amount of needed items is in both shillings and dollars (my understanding is that 1,000 shillings equals approximately 50 cents). My thought is that one person may say that they would be interested in contributing to two English books while another person might get their family involved and commit to two desks and another person might want to pay for school fees for three children for one term or one child for a whole year (70,000 shillings a term includes supplemented protein and is the equivalent of about $40.00). Or even, someone might say, "I have four extra dollars and I would like for it to go towards a swing set," and eventually, over time, we will be able to contribute a swing set. Right now the school is not set up as a charity and therefore one could not get a tax right-off for the contribution but the boost your heart will get in return is worth so much more. But please let me know your thoughts and if any of you would like to contribute even the smallest amount or if you have any better ideas of how to go about this, let me know! I would also encourage anyone who is planning a trip to Uganda or lives near Kampala to go visit the school and maybe plant a tree alongside the ones that J and I did and offer the kids a big smile in support for their efforts to grow and learn and contribute to their community and therefore the world.